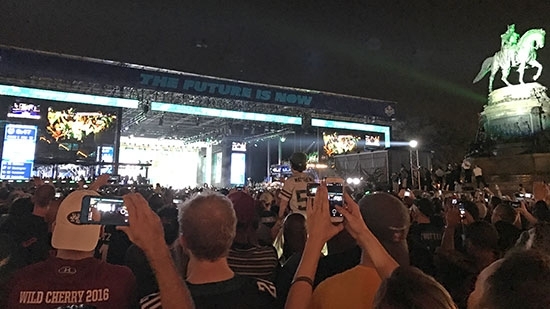 Fans in Philadelphia set an NFL Draft record on Thursday with over 100,000 attending first round festivities on the Benjamin Franklin Parkway. The NFL Draft Experience features many activities including mock locker rooms, a museum, NFL Combine, virtual reality experience, zip line, and many more. The live draft show itself kicked off at 8pm from the massive theater/stage on the Art Museum steps. The mix of fans from all over the country supported by Philadelphia's passion for football created an electric atmosphere. Boos, cheers, cries of lament, and chants of team pride carried through the night. The Cleveland Browns selected defense end Myles Garrett of Texas A&M as the first overall pick. The Philadelphia Eagles had the 14th pick and selected defensive end Derek Barnett from Tennessee. The Draft continues today and tomorrow, and it is free. Delaware investigators are looking for witnesses to the fatal shooting of a Delaware State Trooper earlier this week. Cpl. Stephen Ballard was shot in the parking lot of the Wawa store at 1605 Pulaski Highway in Bear, DE around noon on Wednesday. Ballard approached a suspicious car with two men inside. He was shot multiple times by the passenger, Burgon Sealy Jr., who fled the scene. Sealy Jr. barricaded himself inside his Middletown home for 20 hours before he was shot and killed by police on Thursday morning. If you saw what happened, or have any other information related to the shooting, you are asked to contact Det. Jon King at 302-698-8561, Crimestoppers at 1-800-TIP-3333, online at Delaware.Crimestopperweb.com, or by sending an anonymous tip by text to 274637 (CRIMES) using the keyword "DSP." Congress has passed a short-term measure to prevent a government shutdown. The measure will keep government funded for another week and allow lawmakers more time to reach a deal on the budget. The measure will now go to President Trump's desk for his signature.